Matt Stevenson (BMW 1000) climbed to the top of the Derby Phoenix club’s 1300cc Four-stroke championship with four top-four finishes in the second round of the series at Cadwell Park. After seven races this season Stevenson now heads Lee Wilson (BMW 1000) by 131 points to 126. Stevenson, the 22-year-old from Ripon, Yorkshire made a good start in the eight-lap first big bike race on Saturday afternoon, holding second place to Lee Wilson (BMW 1000) at the end of the opening lap. But Stevenson slipped back to fourth place by lap five and was lucky to cross the line third, after Kingsley Ruddy (Kawasaki 1000) had retired with mechanical problems on the last lap. Wilson took the win, just over three seconds clear of Stuart Martin (Kawasaki 1000). Ruddy bounced back to take victory in race two, run in heavy rain, with Martin second again, just under three seconds down. Wilson picked the wrong tyres and could only managed third, over 16 seconds clear of Stevenson. Wilson, the 2014 Derby Phoenix club’ 1300cc Four-stroke champion, had now stretched his lead in this year’s series to 44 over Stevenson, but things went downhill on the Sunday. Using Pirellis, instead of the usual Dunlops on his newly acquired BMW, Wilson struggled home sixth in Sunday’s first race, won by Stevenson, by nearly 30 seconds ahead of Martin. A long way off the right set-up on the new tyres, Wilson gave the final race a miss and with Stevenson the winner again, this time over 12 seconds in front of the consistent Martin, the championship lead had swung in favour of Stevenson, by five points. On the first day he had a good race with Martin to win the ten-lapper by seven tenths of a second. Jordan Rushby (Yamaha 600), the talented teenager from Beverley, Yorkshire was third, chased home by Tom Neave (Kawasaki 600), with Tom’s twin brother, Tim, on his Kawasaki 600 fifth. Martin won race two, with Wilson just one second behind. Tim Neave was third, brother Tom fourth, Aaron Clarke (Kawasaki 600) fifth and Rushby sixth all covered by two seconds. Clarke won the third Allcomers race late on Sunday, beating Tim Neave by over four seconds, with Martin third in the damp conditions. Jordan Rushby found the opposition tough in both the Formula 600 and the Superstock 600 class, but still managed to extend his lead in both championships. After four hard-fought battles Rushby led the F600 series by 38 points from Aaron Clarke and the Superstock 600 championship by the same margin over Clarke and Callum White. The 21-year-old Neave twins, Tom and Tim, from nearby Saxilby, on their Kawasakis, dominated race one, grabbing first and second places. Aaron Clarke chased Tim over the line, less than a fifth of a second down. Rushby failed to finish, pulling out on the third lap, after some big slides caused by using old tyres. He crossed the line over 15 seconds clear of Rushby, who had switched to newer, though still used, tyres. Tim Neave was third, but brother Tom, who had been second at one stage crashed at the Mountain on the sixth and final lap. Tim Neave won race three, beating Clarke by over 14 seconds. The rest were over a minute further back. Paul Rogers (Kawasaki) third, five seconds in front of Rushby. Tom Neave was forced to pull out in the closing stages with handling problems caused by a damaged head stock in the previous day’s crash. Clark notched up another win in the final wet race, beating Tim Neave by over four seconds. Rushby was well back, in third place, but having done enough to increase his lead in the two championships. Tom Neave only managed a lap before being forced to pull out again. Michael Hand (Yamaha 750) joined some illustrious company by winning the Yellowbelly Cup, a completion run for many years and open only to racers from Lincolnshire. The handicappers were kind to him. He took the lead on the fourth of ten laps and ran out a comfortable winner, over 31 seconds in front of Callum White (Kawasaki 600) and Arnie Shelton (Honda 125). Pre-race favourites, Stuart Martin (Kawasaki 1000) and Aaron Clarke (Kawasaki 600) were given too much to do. Martin fought through to fourth, but Clarke, who set the fastest lap crashed out at Mansfield after eight of ten laps, battling with Martin. Alan Naylor (Yamaha 250) was the star of the Two-stroke GP class. The 39-year-old from Wakefield, Yorkshire notched up two wins and a second place over the weekend. He headed home Dan Walling (Yamaha 250) by over 12 seconds in race one, setting the fastest lap of the race. He won race two, beating Paul Fyson (Honda 125) by 19 seconds and again set the fastest lap. 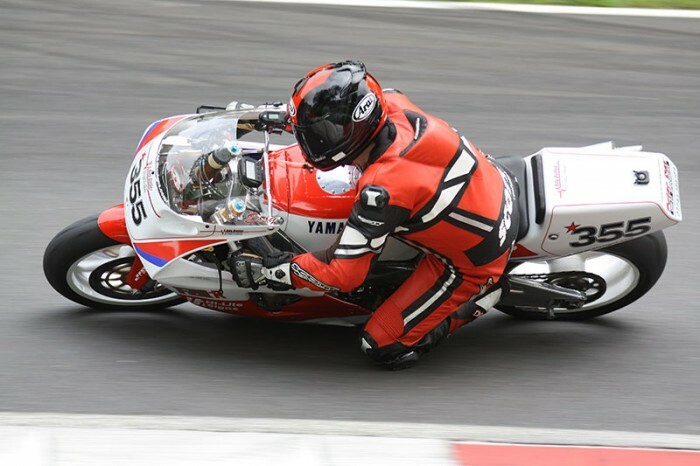 Rich Grinling (Yamaha 250), who had been racing in the ACU 250 championship at Oulton Park the previous day, joined the line-up for Sunday’s two races. Grinling won the first of those, in wet conditions, by just four hundredths of a second from Naylor, the pair chased home by Fyson. Naylor failed to start the final race, suffering from a flat battery at the start of the warm up lap. Arnie Shelton (Honda 125) took victory, over 17 seconds in front of Walling, with Grinling third, just over a second further back. Mark Ess took both the Hi-Lite Signs/Ady Butler Electrical sponsored 1989 OW-01 and the 1993 YZF750SP to compete in the Classic Superbike classic. He took the OW01 out in practice and had no issues. Due to poor entry levels, the Classic Superbikes and the Thunderbikes were combined with the 1300 open races. This meant he had some difficult competition with the modern 200bhp bikes with all their fancy traction control etc. However, he managed 1st in class and 6th on the road in race one. He used the YZF750SP for the Yellowbelly practice, but all was not well. The fitting of a new shock had introduced a handling problem that would sideline the bike for the rest of the meeting. The weather turned just before the second Classic Superbikes race. With no time to fit wets in and his little boy’s bed time fast approaching Mark decided to take five-year-old Oscar, home to Louth, instead. On Sunday the weather was mostly better than had been forecast. In the first Classic Superbikes race, Ess had to start from the back of the grid due to missing the last race on Saturday. The track was damp in places, but drying, despite the fact that it was actually raining, making very tricky conditions. Most of the field elected to use wet tyres. Ess took the gamble of using dry tyres and it paid off. He had an epic race, coming from the back of the grid to finish fourth overall and first place in the Classic Superbikes. Had he started from further up the grid he might have been on the podium, but he ran out of laps. Ess was really looking forwards to the Yellowbelly race, but it turned out a bit of a disappointment, because after setting off fourth from the back he had used the best of his rear tyre in the 1300 race, so was unable to manage the lap times he had done earlier. He finished 10th, but spent most of the race riding around on my own. .
With the weather making a serious turn for the worse, Ess headed for home, missing the last 1300 open and Classic Superbikes. Lee Crawford and Jake Lowther (Suzuki) and Simon and Tom Christie (Honda) shared the wins in the four Open 600 Sidecar races, but it was John and Nigel Lowther (Yamaha) who moved to within one point of the absent Peter Millington and Nick Roberts. Crawford won the first race, just under three seconds ahead of Gary and Daryl Gibson (Suzuki), with Simon and Tom Christie third, some way back. The father and son Christie pairing of dad, Sam, 52 and 18-year-old Sam from Beverley, Yorkshire took victory in the wet race two, almost ten seconds ahead of the Gibsons, praising the handling of their new CES chassis. Crawford won race three, over 17 seconds clear of the Gibsons, with John and Susan Longmore (Honda) a long way back. A faulty fuel-pump fuse put the Christies out early on after a making a good start. That breakdown put the Christies on the back row for race four, but they were up to second at the second corner, going on to win, by over 13 seconds from the Gibsons. The Longmores were third. Daniel Taylor (Suzuki 650) maintained his unbeaten run in the Mini Thunderbikes, taking his tally of wins to eight. Gary Arden normally an EMRA regular joined the Derby Phoenix Stock twin ranks for this meeting. (Suzuki 650) in the fourth. Jamie Pearson, the 24-year-old from Derby, was in tremendous form in the Pre-Injection class winning the first three easily. Faced with yet another change of tyres on his Yamaha, he decided to give the fourth race a miss. Justin Stephenson tops the championship table on 108.